That’s all the late Sophie Thomas could say when her daughter Minnie Thomas drove her to Tamarack Lake near Skookumchuk, B.C. years ago. Her mother, a Carrier Elder from Saik’uz First Nation near Vanderhoof, made it her life’s work to understand the relationship between humans and plants. From an early age she was shown the medicinal properties of plants dismissed by developers and mainstream society as weeds or industrial feedstock. In her early days of healing, it was easy to find red mountain-alder and chokecherry–harvested for her cancer medicine–but as rivers around her were dammed and polluted, forests were clear-cut, and plants were sprayed with pesticides, she found herself traveling further and further to find them. Environmental education was a natural progression. In her seminars, which she started doing in the 1960s, she impressed upon listeners where her remedies came from. She felt the effect of the Kenney Dam, built in the 1950’s on the Nechako River, perhaps more than anyone. “They waste our forest when they make a dam. They feed the river not enough and it goes dry. They feed it too much and the fish and duck eggs wash away,” she said in a newspaper article. In 1989, at a Seattle seminar, Sophie met Terry Jacks, a former singer best known for his 1970s pop song Seasons in the Sun. He had turned filmmaker and was so struck by her intimate knowledge of the land that he featured her in a 30-second commercial for 1993’s Year of the Indigenous People. That spot became the introduction for the half-hour documentary by Jacks in 2000 called The Warmth of Love – the Four Seasons of Sophie Thomas. The camera follows Sophie through a year as she harvests plants, taps balsam tree sap, cuts the edible inner bark from a Jack pine that can save a lost hunter’s life, and boils up raspberry branches on her stove for medicine. Since 2002, snippets of Sophie’s history and medicinal knowledge have been available on her Web site. There, visitors can also order The Warmth of Love video, a book called Plants and Medicines of Sophie Thomas and read testimonials from people who have been cured by her. Sophie’s knowledge was vast. Minnie said most healers know one medicine and the best of them might have four. A diminutive woman, Sophie was orphaned when she was only one year old. Raised by a blind grandmother, she was chosen out of 15 brothers and sisters to receive medicine knowledge, walking the seemingly barren land to find the plants needed for powerful and effective remedies. Always taught that the medicines are a gift given freely from nature, Sophie didn’t charge for her services, nor did she take credit for her success. “The Creator does the healing. I am only a servant,” she maintained. She fasted and prayed before she went picking plants, and marked her face with charcoal as a sign of respect. “Traditionally, a child is chosen before puberty to become a medicine person,” explained Minnie, adding she, herself, was sent away by her mother to a teacher to learn about medicine when she was very young. “I was mad at her and it was only when I became older that I understood why she sent me away.” Now Minnie follows in her mother’s footsteps, traveling to workshops and receiving people for healing. Sophie married Morris Thomas and together they had 15 children, through the years traditionally adopting an additional 15 more from their community. Always active, she helped found Carrier Sekani Tribal Council, Carrier Sekani Family Services, and the Yinka Dene Language Institute. Until her death on March 17, 2010, Sophie lived in a small house hardly big enough to house the many gifts she received for healing. She never kept them anyway, said Minnie, explaining her mom didn’t need much to live on this earth. 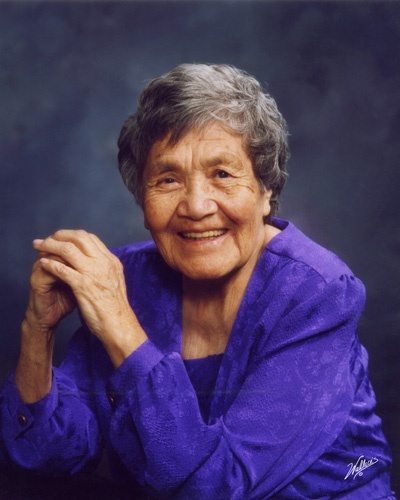 Sophie received an honorary doctorate from the University of Northern British Columbia to recognize her work as a knowledge keeper and medicine woman.